So many people struggle with quitting soda. You might be one of those people, or know someone who is struggling with it. We all know that soda pop is really bad for us. It’s extremely unhealthy, even the diet soda. It’s really just crap. Maybe you’ve been riding down the slippery slope of “I’ll quit tomorrow” with a soda in one hand. Tomorrow never comes. In order to get off the slippery slope and stand on firm ground, you have to dig a little deeper and really find out why you are not willing to give up the soda. I’m sure there are more reasons but you get the idea…. First of all, only you can make the choice about really quitting. Even if someone talked you into quitting, and you’re doing it as a bet, contest, or you need an accountability partner, ultimately you will need to carry forward on your own when those circumstances change. This is your journey. Your body. Your goal. OWN IT. You can’t put the control into someone else’s hands and expect this to work out. You have to do it for yourself because you want to be healthy. You have to decide very specifically about your plan and how you will act on it. You must plan the way that you will handle the physical withdrawal from the caffeine, sugar, and other chemicals that are in your drink. 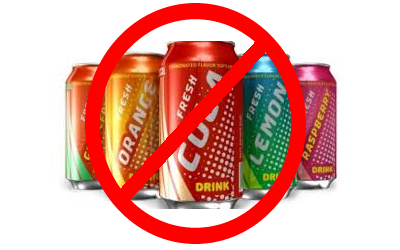 Whether you go cold turkey or cut down, ultimately the day will arrive when you will no longer buy soda. You must have a plan to deal with the emotional urges when you miss your familiar friend. Face the urge. You can deal with any emotion that comes your way. It is survivable. YOU CAN DO THIS. Have a plan on how you are going to redirect yourself when the urge to drink soda comes your way. Walk outdoors. Be active. Enjoy someone’s company. Go walk your dog. Clean the closet. Phone a friend. Journal your thoughts and emotions. Do not eat foods that trigger your urge to drink soda until you have developed a strong habit of drinking water. Stop thinking about the fact that you have given up soda and start reminding yourself that you are now a healthy person who drinks water. PERSONAL MANTRA: Say something positive to yourself that reminds you of all the gains you are getting from your new healthy habit. Latch onto your goal. Find an encouraging quote that you like to help you stay on track, and keep it handy throughout the day. I’ve worked with clients who have food and soda addictions due to it being their way of coping with trauma. Remember, food and drink are the first ways that we seek autonomy as babies, and it is part of our instinctive, hard-wiring. Don’t be ashamed. Just get professional help. Go to counseling. Once you start processing the trauma, or other emotional upsets, then you will be able to start dealing with the food/drink issues. If you are taking a wait-and-see-if-this-works-this-time approach, then you are going to be waiting around for a very long time. When you say, “I’ll try”, you’re leaving the door open to failure. You must slam the door on failure. Failure is not an option. Who wants to be a failure? See yourself as a person who is excited to be energized and healthy. Have a party with yourself. Envision yourself each day being healthy. If other people are not supportive, then call me up and I’ll be thrilled to tell you how awesome you are. Friends and family who are not quitting pop with you will see how well you’re doing, and then they’ll be more likely to give it up, too. It’s each person’s journey, and you have to meet them where they are. All you need is to focus on yourself and your personal journey of health and wellness. Be awesome. Dump out that last pop and tell yourself you’re done, and get a plan together to really be done!!! !